A legal case, known as the Bettencourt affair, shed some light on the life of the heiress of L’Oréal, a discrete, intelligent and still beautiful women. Bettencourt who until then rarely showed up in public and used to live her silent and comfortable life behind the walls of her villa in Neuilly, a very posh suburb of Paris, all the sudden was talk of the town. All started like a family drama and quickly became an affaire d’état involving President Sarkozy and his ex budget minister Eric Woerth. I love, I’ve to admit, the gossip coming up with the affair. It looks, from far, a bit like a French version of King Lear: a thankless child attacks a failing parent and a regime trotters”, as Arthur Goldhammer puts it, a chronicler of French politics at Harvard’s Center for European Studies. It was in December 2007, when Françoise Bettencourt-Meyers, daughter and an only child, filed a criminal complaint against Marie-François Banier, a photographer of celebrity portraits, for “abus de faiblesse”. She actually blaims him exploiting the fragility of her 87 year old mother, to reap gifts valued at about 1,3 billion Euros. The thing is: Françoise and her mother Liliane don’t have any contact since several years. They are not on speaking terms anymore, whereas Liliane Bettencourt describes the friendship with Banier as amusing, exiting and extremely fun. The old Lady although seems to be aware of the fact that her friend is very exclusive and possessive in his relations. In other words: He can’t stand concurrence. He wants her – and her money – all for himself. 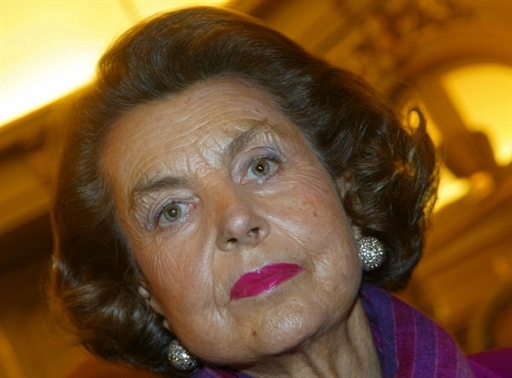 Madame Bettencourt defended herself a long time in claiming that she is a free woman, free to do what she wants with her money. It was, she insisted, her pleasure to make all this presents. Presents? Well, that’s a small word for what she offered her friend: There were paintings, life insurance policies, and an island in the Seychelles. Nothing more. But having a fortune estimated at 20 billion Dollars, that obviously didn’t look a lot in her eyes and at the beginning Madame Bettencourt really didn’t understand all that excitement. This has changed now. That’s at least what you can think after having read an exclusive interview Madame Bettencourt gave to the magazine Paris Match these days. Bettencourt makes quite a good figure in this interview. She obviously still is witty and charming, even if she might not always have all her head. When she is asked how she experienced these hard times, always being in the headlines, having police at home and an employer who recorded all her conversations during more than a year, she only replies: “Are you doing yoga?” The guy, completely disarmed, says that no, he doesn’t. “You should”, she only says.